#1. 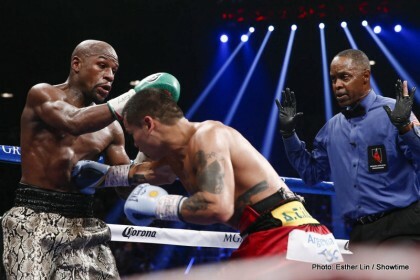 Floyd Mayweather Junior – 47-0-0 (26 knockouts). He’s currently the lineal welterweight champion, he holds 2 of the ‘big four’ world title belts at welterweight – the WBA ‘Super’ world title and WBC title, and he is undefeated and has recently held the championship and WBA/WBC world titles at 154 pounds (superwelterweight/junior-middleweight), simultaneously with the welterweight titles and lineal championship. #2. Roman Gonzalez – 42-0-0 (36 knockouts). Roman Gonzalez has the same problem as recently retired boxer Chris John – he is unknown to casual boxing fans and underappreciated. Chris John held a featherweight world title for approximately ten years and he had even defeated top-ten pound-for-pound boxer Juan Manuel Marquez, but he was still absent from many boxing top-ten pound-for-pound lists, after going undefeated in approximately 50 fights. Roman Gonzalez also has impressive accomplishments but he is overlooked because he is in a weight class that doesn’t get enough attention. He currently holds a Flyweight world title, which is at 112 pounds, but he has also held word titles at Minimumweight/Strawweight (105 pounds) and at Junior-Flyweight (108 pounds). Being from Nicaragua, rather than from the USA or the U.K. probably has something to do with his lack of fame. A fighter who is undefeated after 42 professional fights, with 36 knockouts and world titles in 3 different weight classes should be a superstar in the sport of boxing. #3. Andre Ward – 27-0-0 (14 knockouts). I have Andre Ward ranked below Roman Gonzalez because of his inactivity, he has had fewer fights and his world titles have been in one weight class, rather than in multiple weight classes, like Gonzalez. Some boxing writers have removed Andre Ward from their top-ten pound-for-pound list, or he is at the bottom of the list because of inactivity, but I think he still deserves to be in the top-five on the list because he rarely loses a round of his fights and his inactivity has partially been because of an injury and surgery. I know Andre Ward is criticized for his boring style of fighting and he is known for being a ‘dirty fighter’ because of his dirty tactics, and in his last fight, the referee deducted 2 points from him for ‘unsportsmanlike conduct’, but he dominates his opponents and his fights are usually not even close on the scorecards and there is no doubt or controversy about who won the fight. #4. Wladimir Klitschko – 63-3-0 (53 knockouts). The numbers on his record and his 17 consecutive title defenses are impressive. 5 years ago, I would’ve criticized any top-ten pound-for-pound list that included Wladimir Klitschko, but he has won me over because he has been so dominant over his opponents. Like Andre Ward, his style of boxing is considered boring because he holds his opponents so often, but he rarely loses a round of his fights, just like Andre ward. Also, I was impressed with what he did in his last fight – he knocked out Kubrat Pulev, who was the highest-ranked contender available and undefeated, and he did it before the halfway point of the fight. #5. Guillermo Rigondeaux – 15-0-0 (10 knockouts). Rigondeaux holds 2 of the ‘big four’ major world titles at 122 pounds (SuperBantamweight/Junior-Featherweight) and he accomplished that when he only had about a dozen professional fights. He also defeated Nonito Donaire and took his world title and at the time, Donaire was still on the top-ten pound-for-pound list, or maybe even in the top-five pound-for-pound… Some boxing writers or knowledgeable boxing fans say Guillermo Rigondeaux should be ranked number two or number 3 on the pound-for-pound list, but he has been knocked down several times in his short professional career, so I think a ranking at number five is right. #6. Manny Pacquiao – 57-5-2 (38 knockouts). 2 years ago, I thought Pacquiao would never make it back to my top-ten pound-for-pound list, but less than a year ago, he defeated Timothy Bradley, who I believe was ranked #3 on most boxing pound-for-pound lists at the time, and he got his WBO welterweight title back, so I think Pacquiao earned a spot on this list. #7. Timothy Bradley – 31-1-1 (12 knockouts). Bradley only has one loss on his professional record, and most boxing fans and boxing analysts say he was robbed of a victory in last fight, where he got a draw against a legitimate welterweight contender, Diego Chaves. Even though Bradley lost the rematch with Manny Pacquiao, he kept the fight competitive and that is the only loss on his record, so I think he still deserves to be on the top-ten pound-for-pound list, but ranked near the bottom of the list. #8. Juan Manuel Marquez – 57-7-1 (40 knockouts). When I picked fighters for this list, I took into consideration the fighters’ entire professional career, rather than just the last 12 months. Juan Manuel Marquez has losses on his record, but he has never been knocked out or lost by TKO. He has always looked for challenges, like when he moved up 2 weight classes to fight Floyd Mayweather Junior as a welterweight, even though he had never fought above 135 pounds at the time. When Manny Pacquiao was at his absolute peak, Marquez begged for a third fight with Pacquiao and because of his persistence, he got that third fight. So many people were underestimating Marquez at the time, and not only did Marquez perform well in that third fight with Pacquiao, I believe that third fight was the one fight with Pacquiao where Marquez actually deserved to win the decision. Marquez’ last fight, against Mike Alvarado, showed his boxing I.Q. – he was able to overcome the size and age disadvantage. Juan Manuel Marquez hasn’t fought for almost a year and he doesn’t have a fight scheduled because of a knee injury, but he has said he is interested in fighting Kell Brook for his IBF welterweight title. #9. Gennady Golovkin – 32-0-0 (29 knockouts). I know Golovkin is criticized because of the level of competition he has been fighting for the last couple of years, and he hasn’t had a middleweight title-unification fight yet, but he has been so dominant over his opponents and he’s had so many consecutive knockouts and held his world title for 4 years, so I think he’s done enough to be on the bottom of this list. Critics of Gennady Golovkin, consider this – he’s 13-0-0 in world title fights and 2-0-0 against former world titlists, Kassim Ouma and Daniel Geale. #10. Sergey Kovalev – 27-0-1 (24 knockouts). Sergey Kovalev holds 3 of the 4 major world titles in his weight class and he has been calling out the WBC/lineal champion, Adonis Stevenson for a while, so I think he has accomplished enough to earn the last spot on this list. I have Gennady Golovkin ranked above Kovalev because Golovkin has had more fights, more knockouts and more title defenses and he’s held his world title much longer than Kovalev has had his.